In an age of airplanes, motor cars and asinine ‘reality’ shows, it seems there are few challenging frontiers left for man to conquer any more. 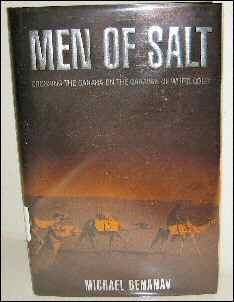 So it is with delight we’re reading Men of Salt: Crossing the Sahara on the Caravan of White Gold by Michael Benanav. The 220-page book is a first person account of an American tour guide Michael Benanav as he makes his journey on camel back from the African town of Timbuktu in Mali to the salt mines of Taoudenni in the North, travelling through the scorching, punishing, cruel heat of the Sahara desert. An easy read, the book provides an interesting account of a wanderlust-driven American, who travels to one of the most forbidding terrains on the planet, to make a trip that the most adventurous would be too scared to even consider. The book deftly intersperses local details of the journey with historical facts and tribal practices in the area. We’ve read 66 pages and like it so far. Most likely, we’ll finish the book later today or tomorrow and will update this post then.